I've installed all the latest Moddingway FIFA 16 mods + ITurbe DB. But when i change the ball before game in Kick-Off mode, it doesn't change it at all. Exapmle - today i played with my bro (on one PC), kick-off mode + Zenit / Spartak + Winter/Snow + HiVis Ball from Adidas. But when entering game it hass changed to some white Nike ball. And that happens all the time, no matter if I'm playing Kick-Off, or tournaments. Probably for russian league is set specific ball in revolution mod. (03-26-2019 08:23 AM)nikolapfc89 Wrote: Probably for russian league is set specific ball in revolution mod. But it's for other leagues also. Like i played custom torunament with Ajax. When i was in Ajax stadium it played with Eredivisie ball (even if i changed to other), and when I played in laLiga stadium it played with LaLiga ball, etc. Changing the ball before game has no effects. I try iturbe latest transfer db but j league and other leagues will removed from the db, or can i manually make the transfers with CM16? How? Remove all specifici balls and that will solve your problem. Then you can switch balls by yourself in game. I've recently got back into playing FIFA 16 Moddingway Mod, and seeing how @Ariel has been away indefinitely, is there a Transfer DB compatible with Moddingway anywhere on the net? As of March 2019? Winter update. Any information on this would be greatly appreciated. Thank you in advance! I'm trying to play J-League in Career mode but the league objectives seem bugged. I assume that one has to give the new league an id of a diffrent league like Ariel did with greek and chinese leagues. Or I'm i missing some option or something. I just played one of the most memorable games ever. Copa America 2016 quarterfinal against Uruguay. It was a HOT game... lots of fouls. 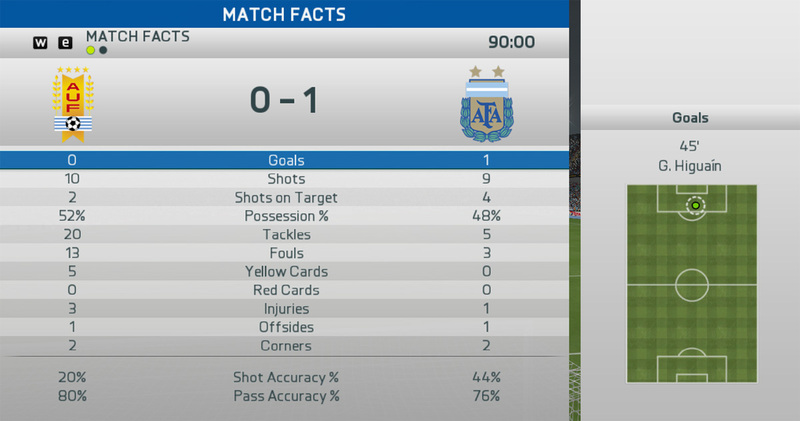 Uruguay was playing dirty after I got the 1-0 goal... even Suarez was booked and he was complaining all the time. Brilliant game all around. No short free kick issue... no short corner issue, no short goal kick issue. So it's not an issue... it really depends on the team how they execute these. Don't touch anything now. Haha. Everything has now clicked, gameplay wise. Injuries are probably a bit too common now. This game had 4. This game was something else. I wish I had recorded it. It's games like these that made this all worthwhile. I got great and memorable games with PES5 back in the day but nothing compared to this. This is _finally_ something that actually resembles a genuine football match. Just look at the fouls and stats. Tight, edgy game between the two rivals... lots of emotion. The crowd noise in FIFA 16 is amazing and this was LOUD.